Zebra mussels are a type of mollusk which gets their name from the striped pattern on their shell. The shell is usually tan or beige with zebra-like stripes. Their colors can range from light with little to no striping to dark brown where the stripes can not be detected. They are typically one inch in length and can live up to five years. They are native to freshwater areas in certain parts of Europe and Asia and were first discovered in North America in Lake St. Clair, just east of Detroit, in 1988. Having no known natural predators in North America, the Zebra mussel can spread rapidly, with females able to lay over one million eggs in a spawning season. They attach themselves to hard surfaces, which is one of the main ways the spread - by attaching to boats, docks, and anchors. It is important to rinse off your boat with warm, soapy water after use and before putting in into another body of water to avoid the continuous spread of the Zebra mussel. Eastern Red Cedar is a species of juniper, although most often referred to as a cedar, which is native to Eastern North America. Even though they are native, they have become invasive in many areas across the country. One female cedar tree produced thousands of seeds each year, which are mainly spread by consumption of wildlife. Eastern Red Cedars are resistant to extreme heat, cold, and drought. When left unmanaged, cedars have the ability to become densely populated and can be viewed as monocultures - when an area is dominated by one plant species. Native lands should be made up of many different species of grass, shrubs, trees, etc. Once the Eastern Red Cedar takes over, forage production can decrease because their low branches and wide base cover a large portion of land and wildlife habitat quality can decline. Their thick leaves block out most of the light so most other plants can not survive under their canopy. The main methods in managing the invasive Eastern Red Cedar are either prescribed burns or using mechanical methods (such as chainsaws, lopping shears, axes, dozers, etc.). Both method are time consuming and must be regulated and planned. 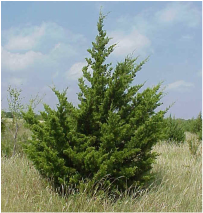 Salt Cedars are evergreen or deciduous shrubs that can be anywhere from 3 - 40 feet tall and, like the Eastern Red Cedar, can form dense populations. They typically have thin branches which are often encrusted with salt secretions - hence their nickname. They have pink and white flowers typically in the summer which can produce thousands of tiny seeds. They were brought to North America to be used as a wind break, an ornamental shrub, and a shade tree. 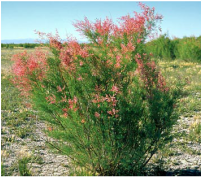 Salt Cedar can survive in arid environments and is considered invasive because it can reach deep water tables with its long tap root - therefore leaving little for other plants and for human use. They also take up salt from the ground water, accumulate it in their foliage, and then deposit it on the soil's surface. The salt build up in the soil causes many of the surrounding plants to die. There is no single control method used in managing the Salt Cedar. Short of digging each tap root and bulb out of the ground - the Salt Cedar has to start being considered part of the riparian environment. It must be utilized for what it does bring to an ecosystem such as enhancing wildlife habitats and minimizing potential fire hazards. Zebra mussel. (2014). In Wikipedia, The Free Encyclopedia. Retrieved from http://en.wikipedia.org/w/index.php?title=Zebra_mussel&oldid=637562137.